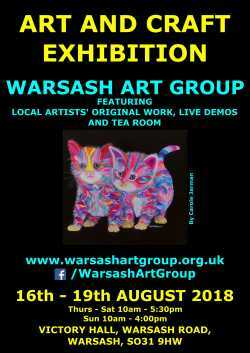 The show began with the Preview evening on 15th August, where the show was opened by Warsash Art Group Chairman Vic Bettridge, together with the Deputy Mayor and Deputy Mayoress of Fareham. Our poster artist this year was WAG member Carole Jarman. The Exhibition Team would like to thank all those who assisted during planning and running of the show. We’d also like to thank all those who submitted Art and Craft work to be exhibited, the exhibition would not be possible without you. Work has already begun on organising the 2019 Exhibition and we can confirm the exhibition will be the same week as this year - open to the public Thursday 15th - Sunday 18th August. Judges’ Choices - Paintings: Alan Akerman – Moonlit Rollers. This year’s judge was Nick Barker. Nick and his partner Caroline spent hours looking over your work and commented on how much they enjoyed the show. Mayor’s Choice - The deputy Mayor and deputy Mayoress chose Imogen Phillips’ Barn Owl as their favourite painting. Visitors Choice - Over 200 visitors voted for their favourite painting and craft item. There was a clear favourite artist in the paintings section. Imogen Phillips got 33 votes between her two paintings, with her Barn Owl just coming out on top. The craft votes were much closer, with only a couple of votes difference between the top 2. Here you find more photos from our Annual Exhibition, along with examples of our members' work including paintings, work in progress and sketches.